Last month, in an attempt to deal with a critical shortage of bags of intravenous solution, the drug company Baxter extended the shelf life of several products. It’s the latest ripple in the health crisis Hurricane Maria set off in Puerto Rico. “Health care professionals are instructed to squeeze the bags prior to use for verification of no leaks,” the Food and Drug Administration’s website warns medical professionals about to use bags that might have corroded in storage. The island is a major producer of drugs and medical supplies, and the hurricane exacerbated existing chronic shortages of IV bags – the most common method for giving fluid and drugs to people who cannot swallow easily – in hospitals on the mainland. In December 2017, 10 weeks after Maria hit the island, Baxter said one of its factories was still being powered by a diesel generator while the others were receiving only intermittent power from the country’s aging grid, which was totally destroyed in the storm. Medical supply chains form just one part of the dizzyingly complex web of interactions between natural disasters, climate change, health, poverty and infrastructure. On the island and beyond, brittle infrastructure, extreme weather and rising temperatures are contributing to a health crisis. The threat they post to vulnerable societies is most apparent everywhere, but it’s perhaps most evident in the recent estimated death toll from Maria and its aftermath: nearly 5,000 people. Keeping up with known interactions and imagining as-yet unknown ways in which climate change is worsening weaknesses in society is a daunting task for researchers, professionals, and policymakers. Collaborations across disciplines and professions help to produce more complete responses, but they’re often few and far between. Funded by the Robert Wood Johnson Foundation, Eric Klinenberg, Director of the Institute of Public Knowledge, organized three conferences with the aim of creating new links and inspiring projects that combine different kinds of expertise in climate change and health studies. In December 2015, the first conference addressed climate change and health; the second, in April 2017, focused on cities and resilience and the third, in May this year, dealt with climate change and infrastructure. In a keynote speech kicking off the first meeting, Howard Frumkin, Dean of the University of Washington School of Public Health, laid the challenge before participants. Understanding the interaction of climate change and health concerns requires systems thinking. 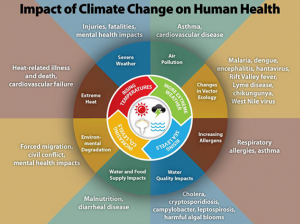 Health is not just a biomedical concern: it is a social, physical and mental phenomenon and climate change has primary, secondary, and tertiary impacts on it. An extreme weather event like a hurricane might result in primary injuries, secondary consequences such as the spread of disease and tertiary effects including migration and conflict over scarce resources like food. Each interaction affects complex systems: rising global temperatures are expanding the reach of the tropics north and south from the equator, for example, leading to the transmission of tropical diseases like dengue to new areas. The bitter debate over Hurricane Maria’s death toll in Puerto Rico illustrates the different approaches systems thinking might suggest. Maria claimed an estimated 64 lives in Puerto Rico on the night of September 20 2017 according to the island’s government. But in a recent study, researchers from Harvard University estimate that, to date, 4,645 people died due to the effects of Hurricane Maria in the months after the hurricane hit. While the official death count, which uses international standards for calculating natural disaster deaths, focused primarily on ‘direct deaths’ caused by things like flying debris, the Harvard researchers included effects such as the destruction of the power grid in their study. If a patient who relied on dialysis to live died, her death would be classified as kidney failure under the official system, not an indirect effect of the storm, removing such statistics from the context of extreme weather or climate change. The combination of neglected infrastructure and climate change is exacerbating everyday risks, too. The most severe weather-related risk the island faces is extreme heat, especially at night. Those unable to run air conditioning are even more vulnerable, while warmer, untreated water is a breeding ground for diseases like dengue or vibriosis, a bacterial infection that can come from contact with water or eating infected shellfish. Kristie Ebi, Professor of Global Health at the University of Washington showed a graphic from the Center for Disease Control that captured many climate impacts on human health – but as one participant noted, the CDC’s formulation left out the interaction of climate drivers and social forces. Under this framework, important links might be missed or remain unmeasured. For example, Ebi discussed the 2004 floods in Mozambique, in which the second highest cause of death after drowning was landmines washed up from the civil war. Last month, thousands of people took to the streets of San Juan, protesting a new raft of austerity measures and the painfully slow recovery from Hurricane Maria. Alongside reductions in employee benefits and cuts to education, a financial oversight board created by Congress in 2016 also proposes a $550 million cut to the territory’s healthcare budget. Another disaster could undo tentative progress toward rebuilding, leaving residents more vulnerable than ever. At the second meeting in 2017, Robert Wood Johnson Foundation’s Alonzo Plough presented findings from a pilot study in Los Angeles that recognizes communities cannot rely on national funds and agencies to respond effectively to disasters as they increase in scale, frequency and length. The Los Angeles County Community Disaster Resilience Project aims to use a community-based approach to help residents prepare for and respond to disasters. In its most recent study, it monitored 16 coalitions brought together under the project, either under the banner of ‘preparedness’ or ‘resilience’. Together, the partnerships worked on a range of projects – from creating community disaster brochures to distribute at local fairs to organizing events. The researchers found that the coalitions grew in size, and trust among many of the partners increased over the two years, but that ‘resilience’ coalitions tended to grow their coalitions more proactively. They also took part in more proactive activities – like setting up trainings for groups they identified as being particularly vulnerable – because of language differences, for example. Community groups are not the only non-governmental entities entering disaster spaces. The electric carmaker Tesla promised Puerto Rico’s governor it would help to patch the grid with solar energy. 51,000 are still without power in Puerto Rico as of this April, and Tesla’s CEO Elon Musk has claimed in a tweet that the company has 11,000 projects underway and has shipped over 1,000 batteries to the island. Tesla is only one of many companies that offered alternative infrastructures to government-owned facilities. The German energy storage company Sonnen is constructing microgrids, and Facebook is offering telecommunications support. 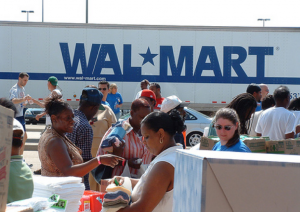 As Andrew Deener, Associate Professor of Sociology at the University of Connecticut, said during the final conference, Wal-Mart was able to use its massive supply chain to distribute food and other goods more efficiently than embattled local and federal agencies. The flexibility Wal-Mart builds into its networks make it a particularly interesting case study for infrastructure scholars. But that doesn’t mean it’s a better model than public systems. It is unclear who will own all the new facilities, or what terms companies will impose on Puerto Rico’s government. The pharmaceutical sector already holds disproportionate power on the island, weakening governance, polluting the environment and offering ordinary residents little in return save low-paying jobs. After all, Katrina’s legacy holds lessons for policymakers looking to foster public-private partnerships. Under the Bush administration, the government took money from FEMA to give to church groups and businesses to help further the impression that they were better responders than government agencies. Power relations also permeate grass-roots climate action in subtle ways, as the aftermath of Hurricane Sandy has shown. Liz Koslov, Assistant Professor at UCLA’s Department of Urban Planning and Institute of the Environment and Sustainability, presented her research on residents of Staten Island who have asked New York State to buy their homes. Their plan is to give the land that’s closest to the sea back to nature, strengthening the natural buffer of undeveloped land between the sea and the rest of Staten Island. Some neighborhoods’ successes have been hailed as a victory for grassroots organizing. But Koslov’s research shows that these neighborhoods tend to be majority white and English-speaking – groups that tend to have a stronger voice on political matters, regardless of income. In Puerto Rico, the protectorate’s political weakness – compared to the fifty states – its lax environmental regulations, which were designed to attract drug companies like Baxter, and its weak and corrupt infrastructure sector make for a health crisis on the island. But the nature of trade links and supply chains means that the effects of the hurricane are spreading beyond its shores, too. By building an interdisciplinary field around climate change and health, the researchers involved in this burgeoning network hope to keep pace with the interconnected effects of a warming planet, inequality, neglected infrastructure and stressed ecosystems. Members of the Institute for Public Knowledge contributed to the reporting for this blog.